The University of Pittsburgh Emergency Medicine Residency Sim Wars Team had a strong showing at The Society of Academic Emergency Medicine Meeting in San Diego, California! 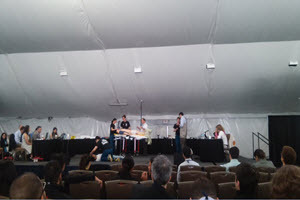 In their round of competition, the team tied Northwestern�s PGY-3 team with a 32-32 audience vote, but unfortunately lost due to the judges tie-breaker vote. Drs. Goodmanson, Fei, Moretti, and Dolan tackled a challenging case involving elephant tranquilizer and an incapacitated nurse. The team was coached by WISER Simulation and Medical Education Fellow, Dr. Andrew Musits. Dr. Musits would like to give a special thank you to the residency leadership and WISER for their support of the team.